Parasect is a Bug/Grass type Pokémon introduced in Generation 1. It is known as the Mushroom Pokémon . The effectiveness of each type on Parasect. In Generation 3, Parasect does not have the Dry Skin ability. In Generation 1, Parasect has a base Special stat of 80. 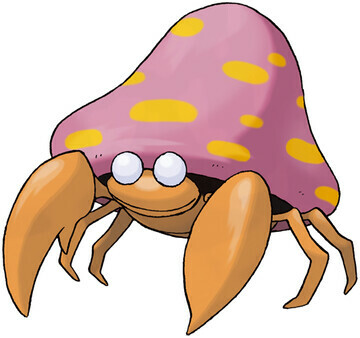 In Generations 1-4, Parasect has a base experience yield of 128. A host-parasite pair in which the parasite mushroom has taken over the host bug. Prefers damp places. The bug host is drained of energy by the mushrooms on its back. They appear to do all the thinking. It stays mostly in dark, damp places, the preference not of the bug, but of the big mushrooms on its back. The larger the mushroom on its back grows, the stronger the mushroom spores it scatters. When nothing's left to extract from the bug, the mushrooms on its back leave spores on the bug's egg. It scatters toxic spores from the mushroom cap. In China, the spores are used as herbal medicine. PARASECT are known to infest the roots of large trees en masse and drain nutrients. When an infested tree dies, they move onto another tree all at once. A mushroom grown larger than the host’s body controls PARASECT. It scatters poisonous spores. It is controlled by a mushroom grown larger than the bug body. It is said to prefer damp places. It stays mostly in dark, damp places, the preference not of the bug, but of the big mushroom on its back. The large mushroom on its back controls it. It often fights over territory with Shiinotic. It scatters toxic spores from its mushroom cap. Once harvested, these spores can be steeped and boiled down to prepare herbal medicines. The bug is mostly dead, with the mushroom on its back having become the main body. If the mushroom comes off, the bug stops moving. Its poisonous spores are also used in traditional medicine. Apparently, spores produced in Alola are not of very good quality. Parasect learns the following moves in Pokémon Let's Go Pikachu & Let's Go Eevee at the levels specified. Parasect learns the following moves in Pokémon Ultra Sun & Ultra Moon at the levels specified. Parasect learns the following moves via breeding in Pokémon Ultra Sun & Ultra Moon. Details and compatible parents can be found on the Parasect egg moves page. Parasect can only learn these moves in previous generations. It must be taught the moves in the appropriate game and then transferred to Pokémon Ultra Sun & Ultra Moon. What is a good moveset for Parasect? How can a pokemon have 5x weakness? Is Parasect (Dry Skin & Sun) the only 6x weakness there is? Do Fire moves deal more than 4x damage to Dry Skin Paras and Parasect? What Virus Does Parasect have?